Latest football news: Bayern Munich to beat Arsenal and Man United for Matteo Darmian: Arsenal and Manchester Untied transfer news summer 2015. Bundesliga Champions Bayern Munich are set to fight Arsenal and Manchester United for Torino full-back Matteo Darmian, according to latest reports. TalkSport reported that the 25-year-old Italian defender has been in link with the Premier League sides since long but Bayern are now leading the race. The German side have planned to send their scouts to watch the Italian’s game in upcoming European Championship qualifier game between Italy and Croatia. The former AC Milan full-back has a value around €22 million and his current contract has two years left. The reports in Italy revealed that Bayern Munich have offered €16 million for the Serie A star defender. Meanwhile, Torino are not likely to sell him for less than €20 million. With several sources revealing that Arsenal and Man Untied are still keeping tabs on him and could make a bid to seal his deal. 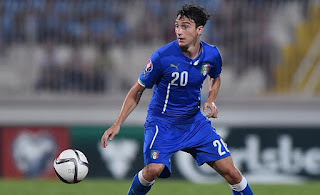 Darmian was a regular player last term for the Italian outfit. He made 33 appearances in Serie A and 10 in Europa League last season. Torino is in no moods to sell their star man as he has been consistent for them since his move from Palermo in 2010. However, if a demanded fee is offered then they will surely sell him.